Doug Smith, a former RMC Redmen football team captain (1968), coach and Squadron Commander is being inducted to sit beside his two life mentors, namely Doug Hargreaves and Danny McLeod, on the AWOD wall. The formal announcements will start this week in e-Veritas. In advance of the ceremony, I am attempting to reach out to some of Smitty’s players from the mid-70’s including the likes of Glen Tremblay, Bill Judd, Ed Loziak, and Ray Richardson to invite them to attend the ceremony to celebrate this honour being bestowed upon RMC’s most “giving” former football player. Smitty has been coaching CIS/NCAA football since 1973 as a volunteer coach while holding down senior management and general management roles in a number of companies here in Canada and the USA. Combined with his playing time and scouting duties performed for RMC in the early 70’s, he has accumulated over 54 years of dedication to amateur football and mentored thousands of scholar athletes along the way. A very deserving induction to AWOD for his lifetime commitment to football. James Doherty and Craig Wood from the 1978 fourth year team will be in attendance but some of those listed above may want to attend as well. As Class Secretary of the Class of 1976 I was hoping that you could put me in touch with these former RMC Redmen so that I can extend an invitation on behalf of the Class of 1970 and the AWOD Selection Committee to attend this year’s event which once again is coupled to the RMC Varsity Sports Awards Ceremony. Look forward to hearing back from you at your earliest convenience. Information for Class of '76 - our class Committee met via teleconference on Feb 11th, 2018 and discussed issues related to our Old Brigade entry in 2021 along with the status of Class of '76 donations. The end of an era has arrived: Mr. Bruce ‘I live for AIMP’ Lewis has decided to hang up his hat after 44 years of service (the last 15 of which were in the Public Service). You are invited to an informal – and undoubtedly entertaining – gathering at the RCAF Officers’ Mess (158 Gloucester Street) on Friday 26 January 2018, at 1600 hrs. Since Mr. Lewis’s extensive Rolodex is in his head, I ask that you please forward this info to anyone I may have missed – I’m sure there are many. I will ensure ample opportunity for those who wish to make remarks – just let me know ahead of time. Anyone is welcome to send me photographs or bring in memorabilia. If you are unable to attend but wish to send any anecdotes along, please do so. Bruce Lewis joined the Canadian Armed Forces in August 1972 from Sault Ste. Marie, Ontario. He attended Royal Roads Military College and RMC graduating with a degree in Electrical Engineering in 1976. Following graduation, he trained as an air navigator and flew some 3700 hours on Argus, Sea King and Aurora aircraft from Summerside, Shearwater and Comox respectively. During his military career commanded two Sea King detachments, the Helicopter Test and Evaluation Facility (HOTEF) during the first Gulf war where five Sea Kings were modified, tested and deployed in two weeks and 407 Maritime Patrol Squadron. He also served as the Wing Operations Officer at 19 Wing Comox. Outside of flying, he served five years as technical support office at the Defence Research Establishment Atlantic focused on underwater acoustics in support of sonobuoy development, the operational test and evaluation of the new Aurora aircraft and the navy’s underwater warfare program. During his time at DREA, he obtained a Masters of Applied Science in Electrical Engineering from the Technical University of Nova Scotia. He also served in the NDHQ Secretariat as the Air Officer working directly for the VCDS following Staff College in the UK. Mr. Lewis has been the project manager for the Aurora modernization and life-extension since August 1997 and also served as the Maritime Director from December 2007 to July 2014 in addition to his Project Manager duties. He retired from the Canadian Forces in February 2002 and joined the Public Service. Along with his wife Elaine and his daughter Amanda, who works in paralegal and is an avid horse owner, he lives in Orleans. After 20 plus years as the Project Manager for the Aurora aircraft, I am retiring in early 2018. My last day in the PMO will be the 26th of January 2018 on which a beer call will be arranged at the RCAF mess in order for me to say thank you for the support I have received from the ADM(Mat) and RCAF management team, the Aurora community and the great staff, who have supported me so excellently over the many years as the PM and the industry contributors to AIMP’s huge success. A formal announcement will follow with the details of my retirement plans and the transition plan for the PMO leadership. I wish you all a Merry Christmas and Happy New Year and look forward to sharing a drink with you around the 26th of January. Thank you very much to the Buds who have made donations to the Class of '76 Projects Funds already. Here is a break down of where the donations have been designated by you. Merci beaucoup à tous ceux qui ont déjà contribués au Fonds de notre classe. Veuillez consulter le document ci-joint pour les détails d’affectations courants, enregistrés avec la Fondation des CMR. For Class Members who are looking to make a donation, now is the time to do it to reduce the amount of tax that you will have to pay for 2017. 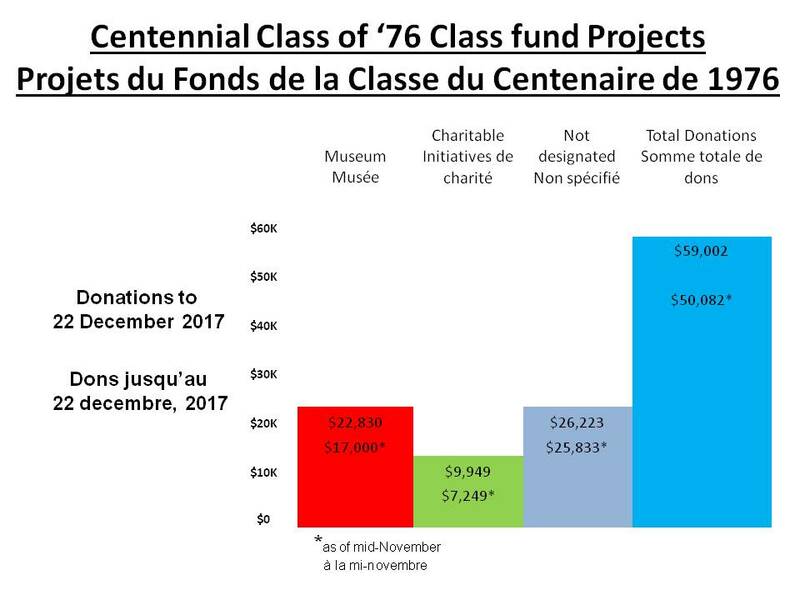 Go to this link: https://rmcfoundation.ca/ways-to-give/donate-now/ Enter our class '1976', check the 'Endowment Box' and in the comments section, specify which project you wish to support. Thanks. Pour ceux qui songe contribuer, c’est le bon moment pour le faire, car on peut reduire son impôt pour 2017. Veuillez visiter le site: https://rmcfoundation.ca/ways-to-give/donate-now/ et choisisez “français“. Inscrivez promotion “1976”, et cochez “Fonds de dotation”. Dans la section pour les commentaires, veuillez indiquer à quel project vous voulez allouer votre don. Merci pour votre appui. Your Centennial Class of ’76 Projects Committee (CC76) has been active during the last month drafting and re-working an Endowment Agreement (EA) with the RMCC Foundation so that we can collect interest/dividends on the total amount in the CC76 Fund. After many iterations and amendments, the final document was signed off by your committee reps and the Foundation. You can read the EA by clicking on the document at the link below. If you have not made your donation yet this year, there is still time to do it. 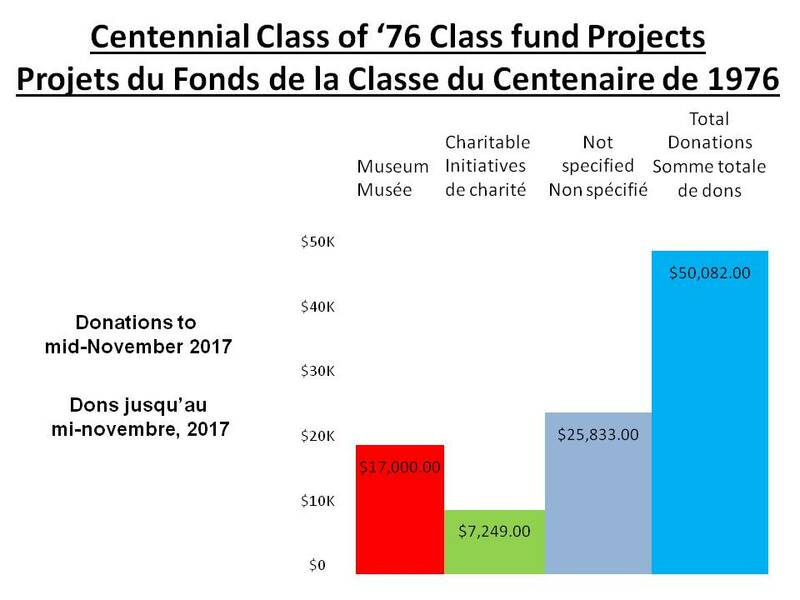 Go to this link: https://rmcfoundation.ca/ways-to-give/donate-now/ Enter our class '1976', check the 'Endowment Box' and in the comments section, specify which project you wish to support. Thanks. On Mon 11 Dec 2017, I was invited to participate in a two-hour national teleconference with class secretaries, RMC Club executives (including Rocky), regional club presidents and other interested parties. The teleconference was initiated by an invitation by the Comdt (BGen Sebastien Bouchard) and the Principal (Dr Harry Kowal) to listen to a presentation by the two of them regarding the recent negative report in the press by the federal Office of the Auditor General (OAG). First, the Comdt has placed a great deal of trust in the Club to include us all in his efforts. This has not always been the case. As for the OAG report, I will tell you quite frankly that it was not a fair or accurate report. Although true that RMC has problems (name an institution that is perfect), it seems from all that I have read and heard, that the OAG was looking for a scandal and when it did not find one, it tried hard to paint the College in a negative light. Mais le Cmdt et le Directeur d'Etudes ont pris la haute route morale. Plutôt que d'accuser le OAG d'une opinion biaisée, ils ont décidé de présenter les faits corrects lorsqu'ils sont «incorrects». They are now working hard to implement all positive recommendations and to correct any misconceptions. I will not attempt to tell you all that was discussed but I would like to summarize. Je veux vous dire que le Collège est entre de bonnes mains. Le Cmdt et le Directeur n'ont pas pris ce rapport à la légère. They have taken a positive and pro-active approach. They have an active and rigorous plan to address all of the issues raised by the OAG. Thank you very much to the Buds who have made donations to the Class of '76 Projects Funds already. Here is a break down from the Foundation of where the donations have been allocated. Enter our class '1976', check the 'Endowment Box' and in the comments section, specify which project you wish to support. Thanks. A donation to the Brain Tumour Foundation of Canada in memory of Matthew was made on behalf of our Class of 76. His full obituary is posted here. Veuillez consulter les documents ci-joints pour de plus amples informations au regard de ces deux projets, et comment vous pouvez effectuer des dons. Je voudrais aussi vous demander de songer à combien vous voudriez donner, et quand cela sera convenable. L’lorsque vous avez décidé, veuillez remplir la formula ci-jointe et me l’envoyer par courriel (un scan suffira également). Tous dons individuels seront gardés strictement en confidence. Les sommes totales pour notre classe nous aideront à déterminer combien nous pouvons allouer à chaque projet en proportion egale. La formula de gage contiens de plus amples détails en ce regard. Encore une fois, merci beaucoup pour votre appui. Joyeux Noël at Bonne et Heureuse Année. Je vous souhaite meilleurs vœux pour 2017. Support for Charitable Initiatives by the Cadets. I would ask that you read the attached documents for more information about the projects and about how to donate. I would also like to ask that you consider how much you would like to donate and when. Once you have done that, I would ask that you complete the attached pledge sheet and e-mail it (or a scanned copy of it) back to me at this e-mail address. All individual pledges will be kept in confidence. The total amounts pledged as a class will be used to determine the amount of support we can commit equally to each of the projects. More details about this process can be found in the pledge form. Thank you once again for your support. Have a Merry Christmas and I wish you and your families all the best in 2017. Read Paul Amyotte's 10 Reasons for Giving - and Donate NOW! 2. Support for Charitable Initiatives of Cadets. The third round of voting finished on 7 November for our class project. We had 99 classmates cast their votes. The 'Lead Donor Class for the Museum' project received 50 votes and the 'Support of Charitable Initiatives for the Cadets' project received 49. As such, the Class Project Committee met via teleconference on Sunday evening, 13 Nov, to discuss the way ahead. It was decided that a compromise was in order. As such, it is proposed that both projects will be kept as the class projects assuming that approval from the Cmdts of RMCC and CMRSJ will be forthcoming for the Charitable Initiatives project. The details of the proposals for each project are being worked out by members of the Class Project Committee and will be published to the Class at the end of November. The second round of voting for the Centennial Class of '76 Project will get underway on Monday, 10 October 2016 and will close at 2359 hours (EDST) on Monday, 17 October 2016. The 2nd round will be to select the project that the Centennial Class of '76 will support. Information about the three projects, some of which has been updated, can be found at the links below. A Survey Monkey e-mail will be sent out to all of the 'Buds' who have a current e-mail address on the RMC Class of 76 website. If you have not received an e-mail concerning the first round of voting, then contact the Class of 76 webmaster at swimbikerun@hotmail.ca to get your current e-mail address added to the list. He will contact Bill Sergeant who will send a 'Vote e-mail' via Survey Monkey to you for the second round of voting. What a great weekend! It was good to see so many of the Class return to “Capistrano” as it were. C’était merveilleux de voir des confrères de partout au pays, de Victoria à Halifax et même certains de l'Europe et aussi loin que Belleville et Toronto! We had 12 attend (6 from the Class) the Legacy Dinner on Thursday evening. We had 143 attend (82 from the Class) the Meet & Greet on Friday evening. Nous avons eu 85 (47 à partir de la Classe) assister au Souper et Danse du Club le samedi soir. We had 60 on parade on Sunday (a couple for the very first time since grad!). In reality, because different Classmates went to different events, I estimate that we had close to 100 who returned for the weekend. Well done! On Saturday morning, Rocky McManus was re-elected to the Board of the Ex Cadet Club as our rep. (excellent news). Later that afternoon Bill Sergeant ran what was probably the best Class meeting we have ever had. Proposals for our Class Project were described and Bill will soon give us all instructions on how we will proceed. Thanks to Jim Pickell for connecting us with Bill Rutledge by way of his phone. Bill is unwell and we all got a chance to wish him our best. Pendant le défilé le dimanche, Jeff Poste m’avait suggéré que nous devrions acheter une pierre commémorative pour Tony Bowie. It is an excellent idea and I was embarrassed not to have thought of it earlier. I bought it this morning. Since not all of the Class knew Tony, I paid for it and am happy to do so. I knew Tony and consider it my privilege to buy his stone. Once it is in place, I will write to his family and send a picture so Rocky can post it on our site. Bien que tous les factures n'ont pas encore été payés, je suis certain qu'il y aura de l'argent qui reste. Unless there are strong objections, I will use that money to top up our Class Bereavement Fund and also start the Old Brigade Coin Fund. Tim Addison has volunteered to guide us in the creation of a unique Centennial Class coin for us to give the Rooks when we Old Brigade Rooks join the Old Brigade in 2021. Our Meet and Greet in 2021 will be in the Senior Staff Mess. Le mess est déjà reservé pour nous. The rest of the details will come in due time. Parking: TIGHT. Plan on parking across the highway behind Normandy Hall (training facility) and take the underpass from the parking lot to inside the Fort. Better, use the municipal lot across from the gas station and walk the 100 meters. Crossing Hiway 2 in the curve is dangerous, so avoid. There will not be someone signing you in. Just arrive and enjoy. If you owe me money (Harv) bring it with you. Our 40th reunion weekend is fast approaching and the Centennial Class of '76 Project Committee has been refining its selection of six projects for members of the class to consider as the project to represent our legacy to the CMCs. The projects reflect the wishes expressed by various class members over the years. Although we have not been able to come to a consensus yet, it is time to bite the bullet and agree on one. There will be a Class meeting in Massey Library Room 7 (ML 7) at 1300 hrs, on Saturday, 24 September 2016. This should give everyone time to watch the parade that morning and grab a bite to eat prior to it. It will be a relatively short meeting (hopefully about an hour) where each of the projects will be presented and the class will have an opportunity to discuss them and ask questions. We will post some of the Q and A on line for everyone's info and flesh out or clarify the final write-ups if necessary. We are hoping for a good turnout at the reunion (30-40 percent of the class). To ensure that we give as many of our classmates the chance to select the class project, there will be two sets of 'on-line votes' to select the class project. The first will take place about a week after the reunion. Classmates will be asked to vote for their top three (3) choices of the six projects that are being considered. A week after the vote goes live, the votes will be tallied and the results published on the Class of '76 Website and the FaceBook page. The write ups for the top three projects will be updated again and re-published on these sites. The second, and final, vote will be called a week after that. Every member of the class will once again have a week to vote for their top pick for the Class Project. This way everyone gets the chance to participate regardless of whether they actually attend the reunion and have time for the meeting. The winning project will be researched in more detail and the class given more information about it. Gentlemen, many of you have been donating to the RMC Fund or the RMC Foundation since graduation. To date, there has been a total of over $65K donated by numerous buds from our Class. These funds have contributed to various projects over the years in support a program of excellence for the Cadets at each of the Colleges. Currently we have $16K in our Class Fund, which has been invested as an endowment with the RMC Foundation at a good rate of return. I would ask that those of you who wish to donate to the Class Fund this year, do so prior to the reunion. This will enable members of our Class to announce this year's contribution at the Legacy Dinner on 22 September 2016. These funds will go to the Class Project, which will be selected before year's end. Online contributions can be made at this link: https://www.rmcfoundation.ca/index.php/ways-to-give/donate-now/ When donating using this link, in the centre of the page, please specify that you are a member of "Class of 76 Fund" by clicking on the Class box, entering '1976' next to it and checking off the 'Endowment' box. Thank you in advance for your support of the Centennial Class of '76 Project. The four remaining seats at the second Class of 76 table are now up for general seating, so if any more classmates wish to attend the Foundation Legacy Dinner, they should reserve NOW with Jennifer. The RMC Foundation is using money from the Wurtele Bequest to regroup the Memorial Stones that surround the Arch and place them such that Class members are together. This will also clean up the weeds that have grown between the stones. Should anyone has been considering purchasing a stone, now would be the best time to do so. They can order the stones through the following link. All of our classmates from Class of 76 are encouraged to read the minutes to understand our relationship with the RMC Foundation. The minutes are posted here. Class of '76 Centennial Monument: It was unanimously approved by the committee to have the monument moved from the former Cataraqui Cadet Mess to a more prominent area near the corner of Fort Lasalle on the Valour Drive side and next to the parade square. Funds from the $14K in the Class of 76 fund will be used. One of our classmates has prepared an aide-memoire on dealing with VAC. If you are interested in obtaining a copy, send me and email at swimbikerun@hotmail.ca. 19th Legacy Dinner. This event is hosted by the RMC Foundation. If you wish to discuss any aspect with the EVP, including the option to book a Class table, please contact Rod McDonald. If you would like to make a reservation, contact Jennifer Jordan at (613) 541-6000 ext 6807 or toll free 1-888-386-3762. The Class of 76 has booked 2 tables. Cost is $200 per person with a modest amount being tax receiptable for personal attendance or a full receipt if you choose to sponsor a Cadet. Dress is Mess Kit/Black tie. The Chasse Galerie members will be featured prominently during this evening. The dinner is almost sold out. RMC Foundation AGM. This meeting will take place in the Commandant's Conference Room which is located across from the new Gym in Yeo Hall at 1330 hours. Obstacle Course. The first years form-up on the square at 1400 hrs and the event kicks-off at 1430 hours and concludes at approximately 1630 hrs on the parade square. Upon completion of the obstacle course, the recruits will be coined by members of the Old Brigade. Class Meet and Greet. Our Class of 76 event is at Fort Frontenac with cost to be $25 if paid in advance and $30 if paid at the door.. The Badging Parade. The parade starts at 1000 hours on the square and includes members of the Old Brigade presenting cap badges to the first year Cadets who are then formally welcomed into the Cadet Wing. Ex-cadet Luncheon. All ex-cadets are invited to take lunch at the Cadet Dining Hall for members of the Old Brigade and the Cadet Formal Mess/New Gym for all other ex-Cadets and their families and friends. Cost is $15 for members and $20 for non-members with advance tickets and $20 at the door for all. Wall of Honour. The induction ceremony commences at 1400 hours. The Class of 1963 is the sponsor of the Wall and ceremony. This year's inductees are: Jim Leech, Gilles Lamontagne, General Guy Simonds. Red and White Sports challenge. This annual event pits ex-Cadets and Cadets against each other on Saturday afternoon. The Winning team will be awarded the Pyper Cup on Sunday morning post Arch parade. Last year, sailing was added which was very popular with the ex-cadets. Reunion Weekend Speaker Series. New this year, the RMC Commandant intends to enhance the weekend through the addition of a Speakers Series which will occur on Saturday afternoon featuring not to be missed speakers. March to the Arch Parade and Memorial Service. All classes are requested to RV at Panet House at 0930 for coffee. Classes will then be marshalled onto the square commencing at 1000 hours. At 1015, markers will be called and all classes will form up on the square initially by class. Once on the square, all classes will be formed into 6 guards. The Old Brigade will comprise 1 Squadron, the Class of 66 will form 2 Sqn and the Old Brigade Recruit Class (1971) will comprise 3 Sqn. The Classes of 76 and 81 will be grouped under the guidance of Class of 76 as 4 Sqn while the remainder of the classes will be grouped together as 5 and 6 Sqns under the guidance of the Class of 86 and 96. Dress: Club blazer or jacket and ex-cadet tie for gentlemen and ex-cadet scarf and equivalent for ladies. Serving officers may choose to wear DEU. Medals are to be worn by all. The parade will step off at 1030 and arrive by 1050 for the Arch memorial service. The parade will return to the Square for the presentation of the Pyper Cup and the Goddard and Dawe memorial swords concluding by 1200. 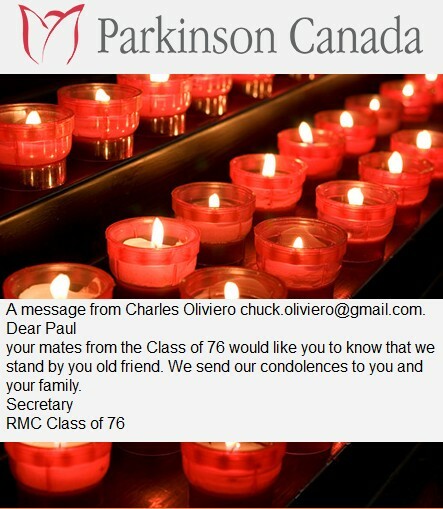 A donation to Parkinson Canada in memory of Katharine was made on behalf of our Class of 76. The response from Parkinson Canada is posted here. Her full obituary is posted here. A donation to the Hospice of Dayton in memory of Lorraine was made on behalf of our Class of 76. The Class of 76 is now on Facebook. Join our Group now! Friday 23 Sep - Golf Tournament, Recruit Obstacle Course, and Class of '76 Meet and Greet at Fort Frontenac Officers' Mess. Saturday 24 Sep - Cadet Parade when the Recruits join the Wing, get 'badged', and receive coins from the Old Brigade. Our Class of 76 will join the RMC Club dinner at the Senior Staff Mess. Sunday 25 Sep - Ex-Cadet Parade where we will marching as Senior Class that has not joined the Old Brigade. Outward Bound offers a variety of courses for vets (means anyone from class of 76). They are free of charge. I recently attended the mountain hiking course and it was very rewarding, challenging as well as interesting. My course contained 5 women, 3 men with both serving and retired CF personnel across all 3 services. I will apply for next years sea kayaking course. Some courses are not fully subscribed and it only takes 15 minutes to complete the application form. So DB, get out west to climb mountains again. Anyone coming out West is entitled to a free steak dinner chez McKay. The Class of '71 (those old guys we form up beside every 5 years and make comments like "We will look much better than them in 5 years) are starting their planning for their entrance into the Old Brigade in 2016. They are wondering if they should continue the recent tradition of coining the rookies so they are gathering feedback from follow on classes that will be affected. I will paste in their email sent to Class Secretaries and Webmasters. I would ask you to read it and post your thoughts on our FB page or send me an email. For your info, I have also attached the replies that Chuck and I sent to Geoff Bennett, but do not be constrained by our personal opinion. In recent years a new "tradition" has appeared at RMC. After the Recruit Obstacle Course members of the Old Brigade present RMC coins to all recruits. The cost of the coins is approximately $3,200 and is paid for by the Class entering the Old Brigade. I'm not sure how the tradition began but it may have been an initiative of the Class of 1966 with support from Al Roberts (former OB Adjutant) and Gerry Stowe (current OB Adjutant). Note that the Class of 1966 has donated more money to the Foundation than any other. When Ray Hook, our Class Secretary, and I asked Gerry Stowe if the Class of 1971 could opt out of the coin tradition, he said that the coins would still be distributed but that the cost would have to come out of the OB account, the balance of which would be cut in half. We asked one of our classmates to do a random sample of cadets to find out if this tradition is meaningful to them. Surprisingly, about 75% of first year cadets appreciated the coin and did not view it as a mere souvenir. Older cadets and recent Ex-Cadets also value the coins and often bring them to Mess functions along with other regimental coins. In my opinion our class money would be better spent on donations to the Foundation or other worthwhile projects. We are currently planning to contribute to the Danny McLeod Athletic Endowment Fund when our class enters the OB in 2016. Most of our classmates are unaware of the coin tradition and may not be too happy about another request for money. 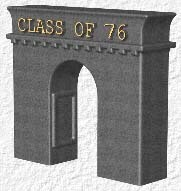 According to "a reliable source" at RMC, the Class of 1969 was reluctant to continue this tradition but in the end they decided to go along with it. So Ray and I are in a bit of a quandary. We are not happy that another class has instigated this rather expensive tradition, thus committing all younger classes without consulting them. We thought that it might be a good idea to canvass your opinions to see if there is a united feeling one way or the other. Accordingly, could I ask you for a Yes or No response plus any comments you might have. Kindly reply to me and I'll summarize the results for everyone's benefit later. PS This coin tradition is not to be confused with the badging ceremony after the Saturday parade, which is paid by Her Majesty. Click here for the response from Chuck and John. Engineers Canada is pleased to welcome Paul Amyotte, FEC, P.Eng., as its president for the 2014-2015 term. Dr. Amyotte will lead the Engineers Canada Board in support of the provincial and territorial engineering regulatory bodies to advance the engineering profession and its self-regulation in the public interest. Click here for the news release. A donation to the Canadian Cancer Society in memory of Annette was made on behalf of our Class of 76. On the occasion of its entry into the Old Brigade in 2009, the Class of 63 created and donated to the College the RMC Wall of Honour "To recognize ex-cadets of the Royal Military Colleges (RMC, RRMC, CMR), and others with College numbers, for outstanding achievements and contributions to Canada or the World, and to inspire cadets thereby". The original agreement between the Class of 63, the Foundation and RMC states that "within ten years, the Class of 63 will have identified another class or classes to assume the leadership and management of the Wall..."
The letter to the Classes of 73 to 93 is posted here. If you think that this is something that our Class of 76 should participate in, please contact Bill Sergeant. Mike More's son Rob was one of the victims of the OC Transpo-train crash. I have posted an Ottawa Sun article about Rob here. Mike has informed us that the service will be at Capital Memorial Gardens, 3700 Prince of Wales, Ottawa. Visitation will be 5-8pm Wed Sep 25th and again noon to 1pm on Thurs 26th with service to follow. Our Class members started meeting each other at Friday's obstacle course. We enjoyed seeing the way the recruit flights worked together to get tasks done - like using strategy in getting everyone over the high wall. It contrasted strongly with the style of race we had which was much more individualistic and the goal was simply to get yourself to the end as fast as possible. Friday evening, we got together at the Cadet Mess and got a chance to chat with everybody to catch up on what was going on in everyone's life. On Saturday morning, we were able to witness the 'badging' of the Recruits by the Old Brigade entry class (1966) and got to see the new 1st year cadets join the Cadet Wing. Saturday afternoon was dedicated to sports - some events were intercollegiate and there were 7 competitions between Ex-Cadets vs Cadets. On Sunday morning, we formed up on parade under the direction of Chuck Oliviero. We looked very sharp on parade in the mist and rain as we treked out to the Arch for the annual service for fallen comrades. While the comments from the group were quite entertaining, the best quote was attributed to Cole Tokei after they read off the list of RMC Grads who passed away in the past year. Cole said "If you are going to die, make sure you do it in the year preceding one of our 5-year reunions so our boys will be on parade to hear your name called". 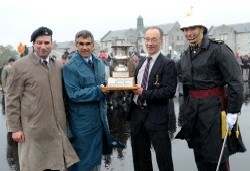 On the return to the parade square, the presentation of the Piiper Challenge Cup was presented. The tradition calls for the RMC CWC to accept the trophy if RMC wins, or the senior Ex-cadet from a winning team if the Ex-cadets win. Most of the games were close, but the Ex-cadets won 4-3 so our Class of 76 was honoured to have the most senior ex-cadets participating and both were on winning teams. John McManus (Water Polo) and Dave Harvie (Rugby) marched out to accept the trophy. For Class of 76 members, this link is a good start. You can read about some of the ongoing projects available and they may spur your creativity in choosing a 'Class of 76' endeavour. This is part of the Foundation website which is easy to navigate through. Take a moment to look through the whole site - under the heading "Ways to give" you will see how to ensure your donations go directly to our class fund or a specific project. I think this will ensure future donations do not end up in a project not of the donor's choosing. From the left hand side menu you can go directly to make an online donation. For those of you who did so on the weekend - again - thank you very much! From our meeting in ML7 (where the seats were not as comfortable as the theatre seats from the 70s), Bill Sergeant received about 6 volunteers to join the steering committee to come up with a 'Class of 76' plan. Bill suggested some initial guidelines which included drafting a framework document by the end of November 2011 that defines the guiding principles for the selection of a class project. Some of the terms that were bantered about at the meeting were: teamwork (Tony Bowie); visibility; focus; Centennial class; unique. This is not meant to be an inclusive list, rather one to get us all thinking. The framework should also include how many classmates constitute a quorum to approve the potential project, who or what positions (i.e. class secretary, committee chair, elected officials) will be given authority to commit funds for the project, who will oversee the implementation of the project, and what should happen to any remaining funds once all class members have departed this life. Dear Comrades, Our Classmate John Rose shone on the sports field, was a loyal teammate and friend, and was personally very popular at RMC. Therefore, it should surprise no one then, that last Saturday afternoon, in scenic lakeside Invermere, a bright and shining sun pushed back the relentless rain that had, to now, been our B.C. Spring..........and revealed that over ten percent of the town's population of 3600 had come out to pay their final respects to their departed town doctor, colleague, and friend. Clearly Dr. Johnson Albert Rose was well loved and respected by the townsfolk of Invermere. Besides the sheer numbers that swelled Christ Church Trinity that day, the constant sound of attending ladies' sniffles, throughout the three Eulogies offered up, underscored the deep sadness and grief that gripped the entire town. Indeed, even prior to my arriving at the Church, while assisting the two middle-aged owners of Invermere's Canterbury Florists, Joanne and Sandy, with the final touches on our Class of '76 floral arrangement, both ladies choked up when speaking of Dr. Johnson Rose, and the tragic accident that took him all too soon. At Ray Ray's Pub, overlooking Invermere Beach, where I lunched and changed into my suit, the patrons I talked to all knew our Classmate, and all mourned his loss. "Shocking" and "tragic" were the common adjectives most used, with one man cursing the rail line that split the town and impeded town peoples' progress. The Service was simple and dignified as Paul Rose, the oldest surviving brother, was introduced by the Anglican Parson, and delivered a heartfelt and poignant Eulogy highlighting Johnson's many accomplishments, interests, and passions. Johnson, Paul told us, was the best oldest brother any boy could've had, and that Johnson had always wanted to be a doctor. Apparently, historical dealings with "the four Rose boys" growing up in nearby Cranbrook, included the concept of picking a fight with one, meant taking on the other three as well. Paul spoke of the enormous pride and love Johnson held for his wife Denise, her skills and efforts as a great wife and mother.........and in her considerable Art talent and accomplishments. On two occasions, Paul emphasized the enormous level of Johnson's pride in his two sons Trevor, 20 and James 18.......and their tremendous accomplishments as two local area sports phenoms. I remember thinking then that "the apples didn't fall far from the tree." Paul lightened the sombreness a tad by referring to Johnson's penchant for British high-performance Sports Cars, his reluctance to operate them at less than their maximum rated speeds.........and "the account" he paid-off (over some time) with the local RCMP. The second Eulogy was from an elderly physician who had recruited our Classmate as a young UBC Medical School Graduate, to intern there in the Columbia Valley. He spoke of John's determination on the ice, as he led the local area doctors to a Medical Association Hockey Championship over teams of MDs from much larger urban areas. That determination, zeal and passion was even stronger, he reported, when Dr. Johnson Rose took on the Provincial Health bureaucracy to obtain important and expensive resources for their local Hospital. In Johnson's soft-spoken manner, evidently visiting BC Healthcare reps would describe a long-awaited item in great detail.........John would politely let them finish.......and then say two words........"but, WHEN??!!!" Apparently the Dr. Rose "But When??!!" procurement methodology worked very well, as Invermere has more medical hardware today per capita than any other berg in Southeast BC!! The final Eulogy was from a lady physician who was Johnson's Medical Practice partner. She was a little shaky at the beginning, but recovered very well to entertain us with stories of John's affinity for exceedingly strong coffee, his dry sense of humour, his off-the-wall observations...........and his ability to silently disappear out the office backdoor (usually down to the Hospital to check on a patient) without being noticed. A reception followed, and I was able to meet John's lovely wife Denise, and his sons, Trevor and James. I also met John's three brothers, Paul, Kevin and Derek. I explained (to all of them) that I had known John (and it was "John" at RMC, and not Johnson, because everything in the military is abbreviated)........and that John had been the Rugby star from Royal Roads who became the fastest player on the RMC Redmen Football team, our starting halfback, and just a guy who was a naturally gifted athlete.........but more than that, John had been truly a great Cadet, comrade, Classmate, and buddy. No one had ever, I reported, nobody at RMC, staff or cadet, had ever had a bad word to say about John. The young John Rose had possessed a quiet confidence about him, soft-spoken yet very witty, with a instant and infectious laugh. He was a very easy guy to like, I said. I made a point of emphasizing that I was there representing all 200-plus Class of '76 comrades of John's, and that many emails about John had gone around Canada, from coast to coast to coast, those past few days. Denise was particularly moved by our Floral Tribute, complete with one RMC insignia front & centre (could be alleged from a pre-worn RMC polo shirt I brought along in the car) and was most appreciative that our Class, from all those decades ago, would remember John so fondly and vividly. I told his sons that their dad was proud and confident, but never vain.........a fiery competitor on the sports field, yet easy-going in everyday situations. John had so many great traits and also strong values like loyalty, toughness, and courage. It was obvious, I said to his sons, that the good people of Invermere knew that Johnson was a great man, and that I was there to tell them, in all honesty and sincerity, that John had also been a great guy as a young man just starting out. In the end, like the town of Invermere, our Class of '76 is poorer today than we were one week ago. This was a shocking and tragic accident which befell a Community Leader, a healer, a devoted husband and father, and an esteemed and valued comrade to us. As Paul Rose said in his heartfelt Eulogy......... "we are all richer for having known Johnson Albert Rose!" 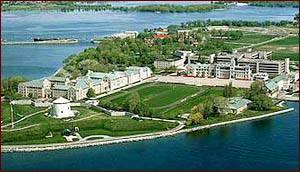 June 25, 2013 marked the 90th Anniversary at a landmark of the Royal Military College of Canada. On 25 June 1923, as part of that year's Graduation Day activities the Governor-General of Canada, His Excellency Viscount Byng, of Vimy, officially laid the cornerstone of the Memorial Arch. Deposited within the stone, in a sealed copper box, were nominal rolls of Cadets and Staff, pamphlets concerning the Arch, the RMCC Review of May 1923, Canadian coins and stamps and the Roll of Honour of the College. Designed by architect J. M. Lyle, Esq., of Toronto and funded by the RMC Club of Canada with monies raised from ex-cadets and other friends of the College. The Memorial Arch, which in all its humble grace, stood completed in 1924. 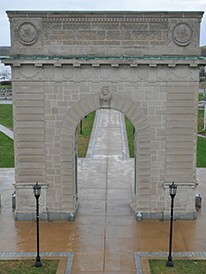 The Arch commemorates the ex-cadets who had lost their lives in the Great War as well as earlier conflicts. The stones around The Arch continue to bear the names of Cadets fallen in conflict, in peacekeeping or fallen to other causes while in service.